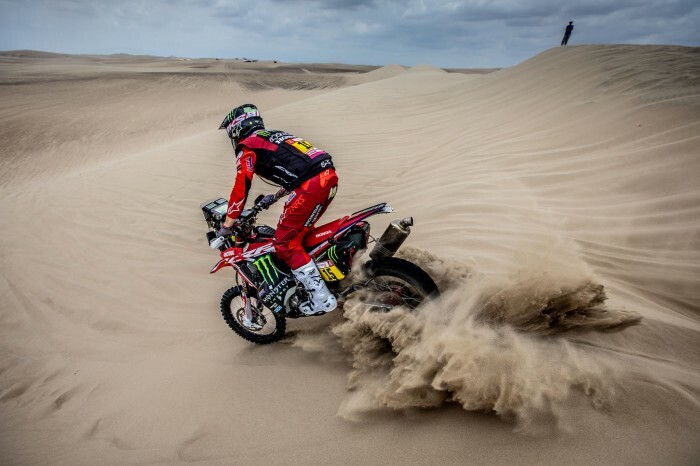 Monster Honda’s Ricky Brabec held on to the 2019 Dakar Rally lead despite a hard charge from Britain’s Sam Sunderland but the American rider’s team-mate Paulo Goncalves crashed out of the event. The start of this fifth stage commenced after a 161-kilometre link section from the Moquegua camp and featured a mass line start with waves of ten riders starting together. The latter part of the special saw competitors face the dunes of Illo with 65% off-piste before a further 345 kilometres of timed special. Brabec ended the stage six minutes behind Sunderland but still has the overall lead. Goncalves broke his hand in his crash and, like Joan Barrera, had to retire from the event. “Today was the second stage of the marathon. Yesterday went really well. I was really mad. I had to push really hard to make up for lost time so I had to really go for it,” said Brabec.